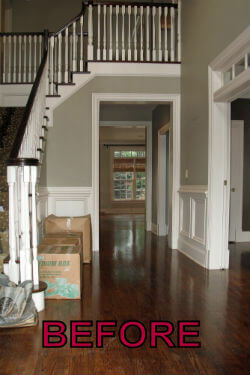 We have a tendency to think that in a vast two story foyer, the idea is to pull the eye upward. In this case, the designer wanted to create a more intimate setting for the entrance to this home. 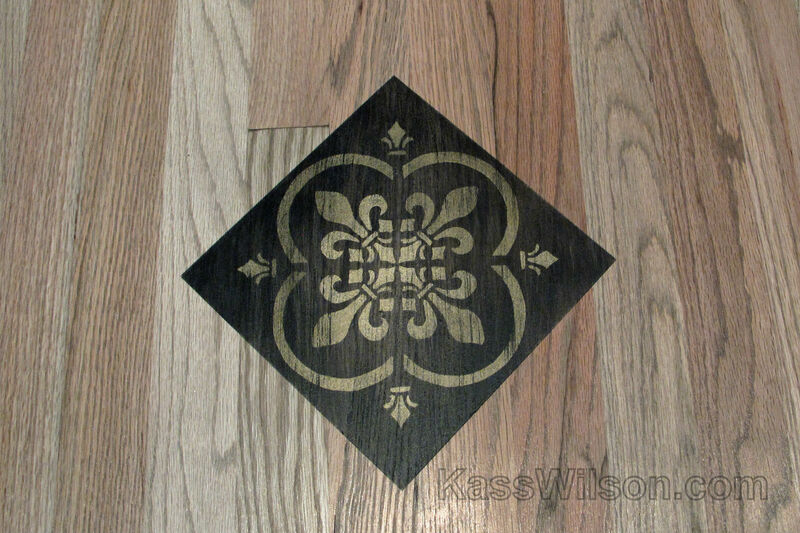 To accomplish this, the attention would be directed downward by painting designs on the floor. 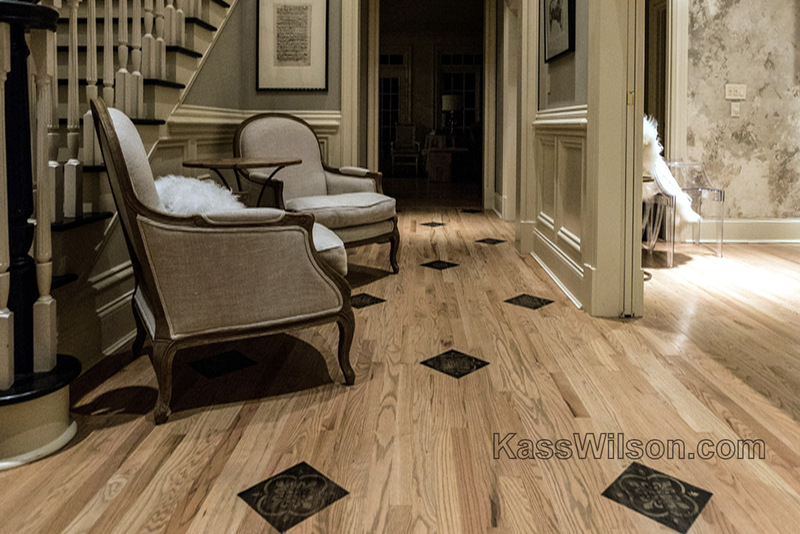 A foyer is the beginning of a story that leads your eye toward feature elements in adjoining rooms. The impression of this home was to be a blending of classic architectural elements with a twist that can coexist with today’s trends. Designer Andie Anderson selected a classic quatrefoil pattern which has remained rich in meaning throughout history. With deep roots in the Gothic and Renaissance era, this classic shape has been used in much of history’s architecture. Because of its structure with four equal portions, it is often incorporated in modern design to symbolize “harmony” with perfect symmetry and proportion. Paired with a fleur-de-lis, it honors the styling of the furnishings. 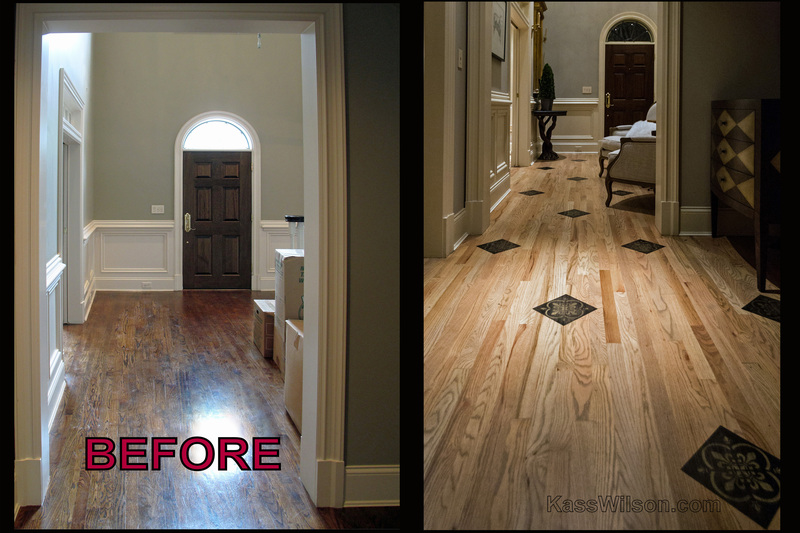 The floors were sanded in preparation for lighter color tones with a hint of gray. Detailed planning allowed us to visualize the perfect layout for the painted designs. 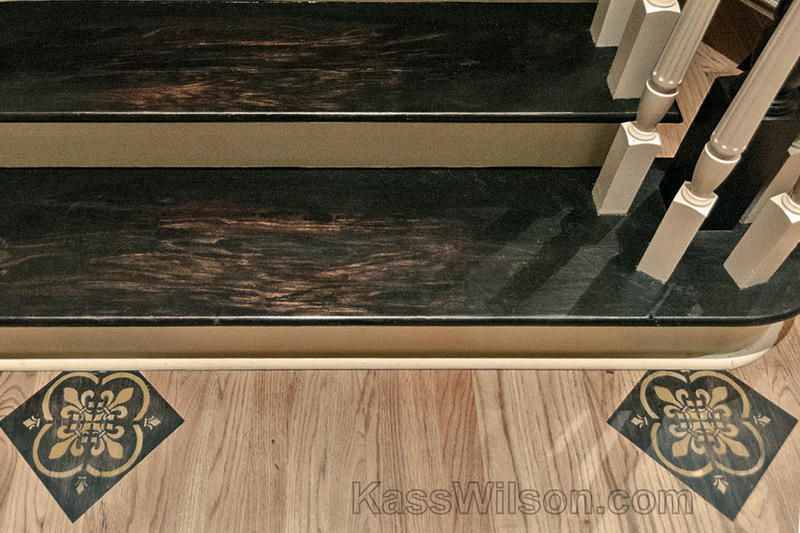 Each quatrefoil was hand painted in black and gold to partner with the grand piano in the adjacent room while the steps were enhanced to reflect a normal wear pattern through the center. 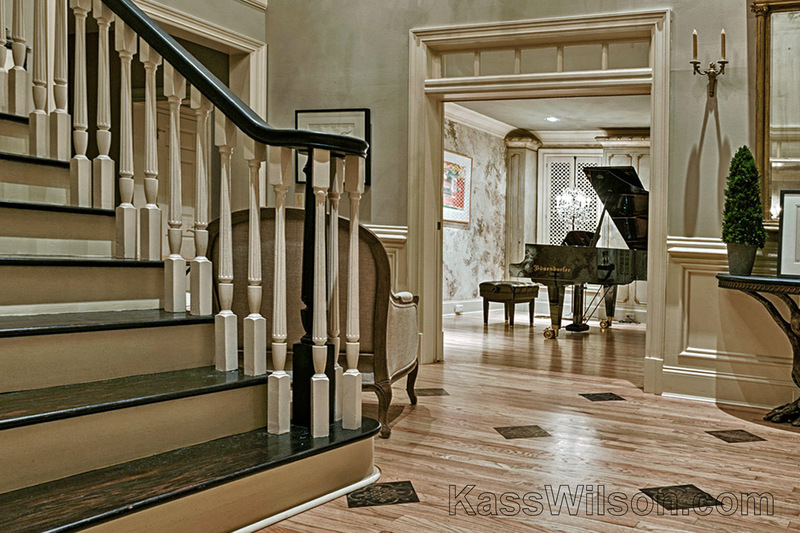 Both the floor pattern and the stairs make the perfect statement about how elements of old and new can easily coexist. Please send a comment our way to tell us what you think. 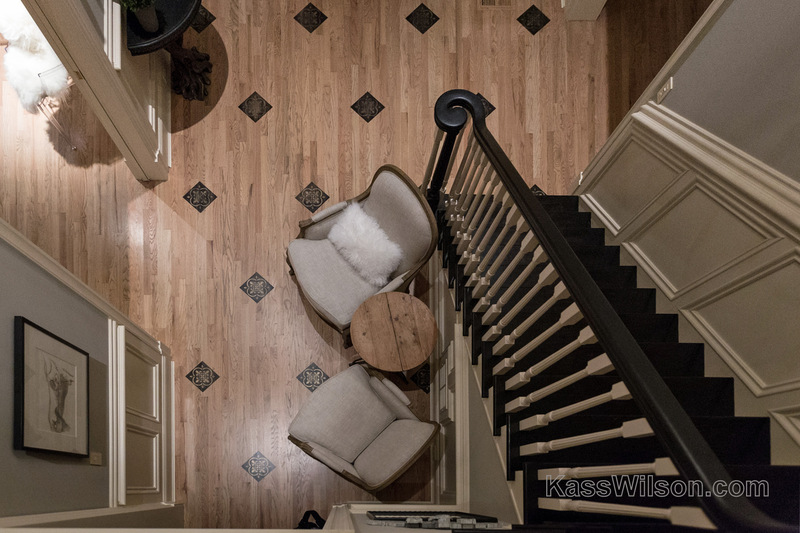 Kass, I absolutely love the floor, and especially the stairs. The “worn look” is pretty impressive! Remarkable transformation Love the pattern addition Great ideas! Wonderful way to transform an under utilized area, the pattern actually breaks up the foyer creating a place that makes you want to linger. Great job!